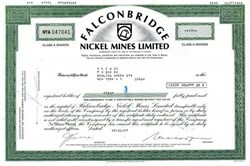 Beautifully engraved certificate from the Falconbridge Nickel Mines Limited issued in 1969. This historic document was printed by the British American Banknote Company and has an ornate border around it with a vignette of the company logo. This item has the printed signatures of the Company’s President and Secretary and is over 34 years old. Sudbury is situated in the Precambrian Shield, a 2.5 billion year old rock, the oldest on the North American continent. It is located in the province of Ontario, approx. 400 km north of Toronto, latitude 46o 11' N to 46o 30' N and longitude 80o 41' W to 81o 00' W. Elevation is 755 to 1,509 ft above sea level and the average temperature is 24.8Co in the summer and -8.4Co in the winter. With a multi-cultural population of 155,219, Sudbury has the third largest francophone population in Canada of cities located outside of Quebec. A multitude of other nationalities are also well represented in the area. Geologists believe that the Sudbury region is the site of a major meteorite impact, which formed a basin-shaped structure rich in deposits of nickel sulphide ore. Mr. James Worthington, a construction engineer with the Canadian Pacific Railway, named the area in 1883 after his wife's birthplace in England. INCO (International Nickel Company) was created in 1902 and Falconbridge Nickel Mines Limited was established in 1928. In 1970, INCO built its superstack, a 1,552 foot structure meant to reduce sulphur dioxide emissions from the ore smelting process. Sudbury was incorporated in 1973 into a two-tier municipal government system, thereby becoming the Region of Sudbury . It underwent further restructuring in 1999, incorporating five towns and two cities into a single municipality, now called the City of Greater Sudbury.